Doug Glanville, a former major league outfielder and Ivy League graduate, draws on his nine seasons in the big leagues to reveal the human side of the game and of the men who play it. In The Game from Where I Stand, Glanville shows us how players prepare for games, deal with race and family issues, cope with streaks and slumps, respond to trades and injuries, and learn the joyful and painful lessons the game imparts. We see the flashpoints that cause misunderstandings and friction between players, and the imaginative ways they work to find common ground. And Glanville tells us with insight and humor what he learned from Jimmy Rollins, Alex Rodriguez, Randy Johnson, Barry Bonds, Curt Schilling, and other legendary and controversial stars. In his professional career, Glanville experienced every aspect of being a player—the first-round pick, the prospect, the disappointment, the can't-miss, the cornerstone, the veteran, the traded, the injured, the comeback kid. 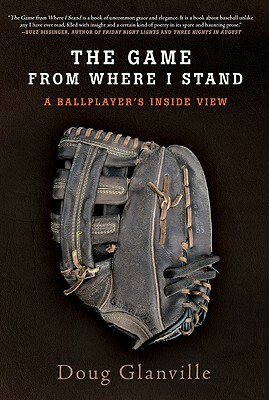 His eye-opening book gives fans a new level of understanding of day-to-day life in the big leagues. Doug Glanville played outfield for the Philadelphia Phillies, Chicago Cubs, and Texas Rangers from 1996 through 2004. From 2008 to 2010, he wrote the online column "Heading Home" for "The New York Times" and provided baseball analysis for XM Radio's MLB Power Alley. In the spring of 2010 he joined ESPN as a baseball analyst, contributing to "Baseball Tonight," ESPN.com, and "ESPN The Magazine." He serves on the executive board of Athletes Against Drugs, the fundraising committee for Boundless Readers, and advises high school student athletes as a special consultant to the Baseball Factory. Glanville grew up in Teaneck, New Jersey, and is a graduate of the University of Pennsylvania. He lives with his family in Chicago. "I have known Doug Glanville for many years and always enjoyed competing against him. Doug was a great student of the game and someone who seemed to enjoy his playing career and took a lot from it. That is demonstrated in The Game from Where I Stand. Doug paints a very entertaining and accurate picture of the game that we love. This book will make you laugh and provides wonderful insights about our national pastime. "—Cal Ripken Jr.